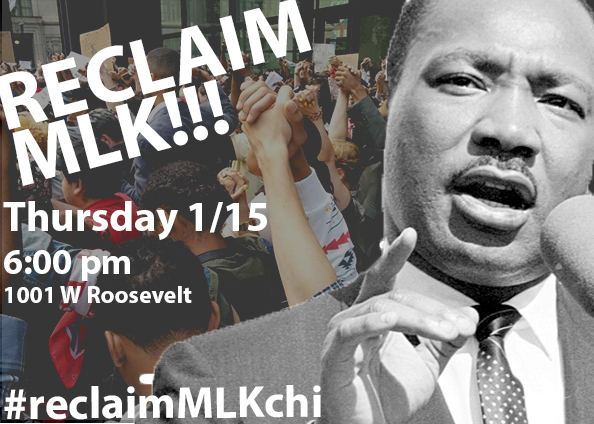 Join us Thursday 1/15 for a 6pm action reclaiming the radical legacy of MLK. On January 15, 2015, an intergenerational coalition of activists and community members, led by youth of color, will be holding a march and rally aimed at reclaiming the radical legacy of Dr. Martin Luther King Jr. Grade schoolers, high school students, young adults, and longtime activists have collaborated on this march, rally, and call to action. We are asking organizations and groups of concerned community members around the city to organize their own daytime actions, and join us at 6pm for a march and rally that will begin at a local school (1001 W. Roosevelt, at the corner of Morgan and Roosevelt), and end at the Cook County Juvenile Temporary Detention Center. Dr. King’s memory has been largely sanitized in popular American culture, with some of his most revolutionary thoughts and words all but wiped from the pages of popular history. At this historic moment, when a movement for black lives is raging in our streets, we believe it is time to reclaim MLK’s legacy, and remind the world that his vision was larger than what they’ve been told to imagine, and that it remains unfulfilled. This action will address the modern day enslavement and oppression that afflicts the black community, and other marginalized peoples, by way of the school to prison pipeline, police brutality, and mass criminalization. We will honor the lives and memories of those incarcerated and killed by this system by lifting up an abolitionist vision of a society that creates safer, more liberated spaces within a transformative justice framework. A response to the daytime call to action could take the form of a direct action, a speak out, or a teach in, so long as it is focused on calling attention to the school to prison pipeline, police brutality, and the reclamation of MLK’s legacy. We trust the creativity of our allies, but some options for solidarity actions might include: walk outs, sit-ins, lunchroom or classroom speak outs, marches, artistic actions, or related workshops. This action is a response to a national call to action (http://soar.afsc.org/) and will be led by youth of color. We ask that those who attend join us in lifting up their words and vision, and that attendees refrain from using their own sound amplification devices during the event.